"It doesn't have any ice cream but tastes like a milkshake! This is a recipe that my uncle told me about. At first I thought, 'Gross! That sounds terrible!' As it turns out everyone in my family loves it; even my picky sister who hates bananas! This is a recipe for when the kids say, 'Mom can we go to Sonic®? We want a milkshake!' And instead the kids can eat a delicious, healthy, and filling summer snack. The most important direction of all: Enjoy!" 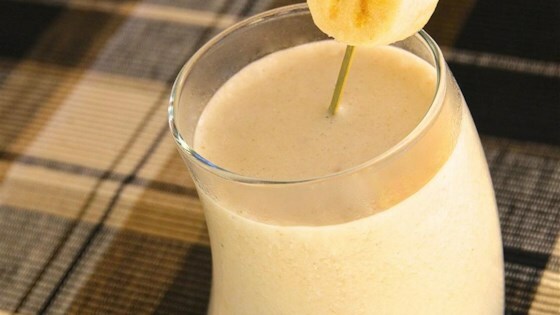 Mix banana and milk together in a cup or bowl until desired consistency is reached. Frozen banana slices are adorned with peanut butter and coated in chocolate. This is one of my favorite low calorie summer treats. I also add Hershey's syrup when I have a chocolate graving and a little vanilla to kick the flavor up a bit. This reminded me of the milkshakes of my youth. Next time, I'd make sure the milk was ice cold so the drink comes out very cold. It was really good in taste. I did not use a blender, so it was not blended well, but it tasted great. It was very yummy and my husband enjoyed it frozen. It was more like ice cream than a shake for him. Mmmmmm I'll probably make this pretty often now.